Don’t miss this informative conversation with Dr. Alex Avery, a veterinary surgeon and founder of one of the internet’s best pet health resources, OurPetsHealth.com on Tripawd Talk Radio. Learn how Dr Buzby’s Toe Grips traction product has helped millions of dogs regain confidence on slippery floors. This episode of Tripawd Talk Radio is not sponsored. 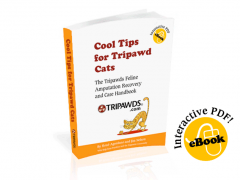 On this episode of Tripawd Talk Radio, Anneli Adolfsson helps pet parents with bereavement counseling, hospice care, after care arrangements, tributes and everything else that helps a pet’s memory live on in dignity and love. 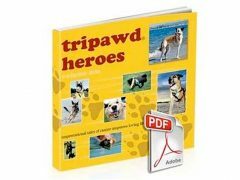 Sharon Seltzer, founder of the Lessons From A Paralyzed Dog website, provides tips, support, news and where to find products for the daily care of pets with paralysis and other neurological conditions on this episode of Tripawd Talk Radio.